We’ve learned a lot by watching the talks from the Hackaday Superconferences. Still, it’s a rare occurrence to learn something totally new. 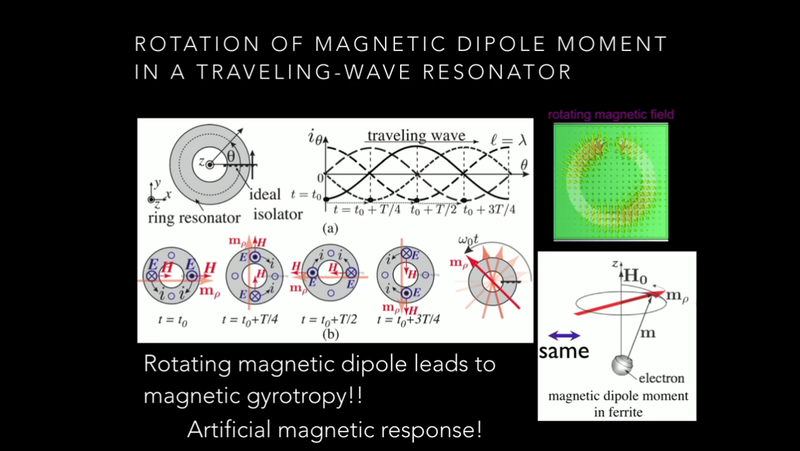 Microwave engineer, professor, and mad hacker [Toshiro Kodera] gave a talk on some current research that he’s doing: replacing natural magnetic gyrotropic material with engineered metamaterials in order to make two-way beam steering antennas and more. If you already fully understood that last sentence, you may not learn as much from [Toshiro]’s talk as we did. If you’re at all interested in strange radio-frequency phenomena, neat material properties, or are just curious, don your physics wizard’s hat and watch his presentation. Just below the video, we’ll attempt to give you the Cliff’s Notes. Freaking Magnets, How Do They Work? In the end, what [Dr. Kodera] is after is something like a diode, but for microwaves: a material that will let waves pass in one direction but not in the other. Such materials already exist, and are in use in very specialized applications, but making the particular ferrite that’s needed is expensive, and damaging to the environment because they require Yttrium, which occurs alongside radioactive ores. 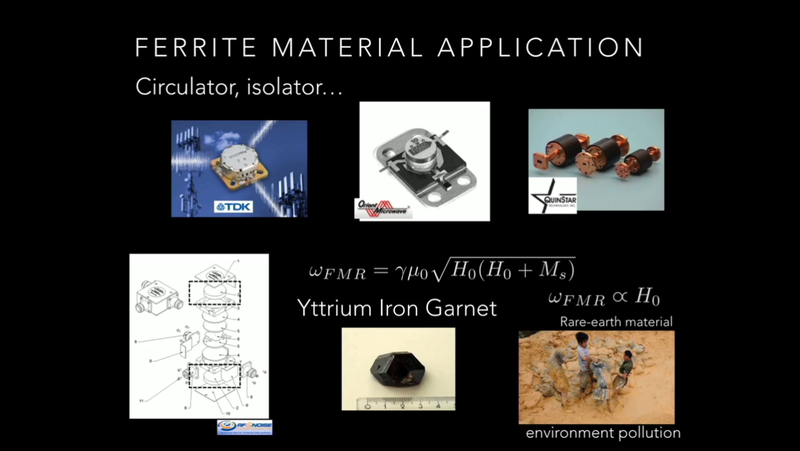 And anyway, yttrium iron garnet is incompatible with silicon technologies, so it’ll never be integrated into ICs. But what yttrium iron garnet does do is exhibit magnetic gyrotropy, and here’s our first physics lesson. Magnets work because of domains of electrons with similar spin. Like the windings in an inductor, the spinning charges make a magnetic field. If you hit certain magnetic materials with an external magnetic field, it effectively puts a torque on them. If you think of the spinning electron like a gyroscope, and you remember something about vector cross products, you’ll recall that when you apply an external torque to a gyroscope, it starts to wobble or precess. The equivalent phenomenon in electrons is magnetic gyrotropy, and getting the spinning electrons precessing breaks a symmetry in the material’s magnetic properties. And this in turn is the key to making one-way wave propagation possible. The other downside of using natural magnetic gyrotropy in a “wave diode” is that the frequency with which the electrons precess depends on the magnetic field strength applied. In particular, they precess at 28 GHz per Tesla of applied magnetic field. You can get a Tesla or so on the surface of a neodymium magnet, but if you want to generate it with an electromagnet, it becomes challenging — an MRI system runs at one to three Tesla, and the detectors in the Large Hadron Collider at CERN run only 8 T. In short, making natural magnetic gyrotropes useful in the microwave range requires big magnets. 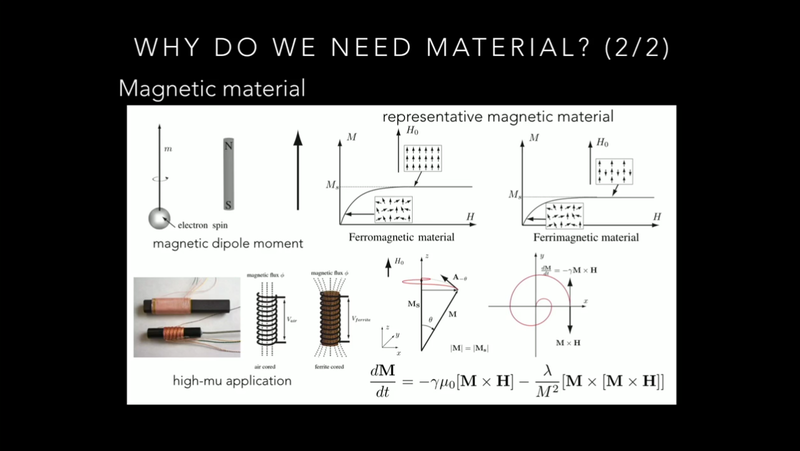 [Dr. Kodera]’s approach is to build up small circuits out of non-exotic materials that, when viewed together as an aggregate, have the same material properties of magnetic gyrotropy. If the individual sub-circuits are small enough compared to the wavelength of interest, the metamaterial will behave like a homogeneous material as far as the designer is concerned, but can avoid using rare-earth elements or requiring hefty magnetic fields. The basic unit of [Dr. Kodera]’s investigation is a ring with a gap in it. Like the split-ring in Hertz’s early electromagnetic experiments the ring will oscillate best at a particular resonant frequency. So far, so symmetric. But then a diode (or FET used as a diode) is placed in the gap of the ring, breaking the symmetry and allowing this basic element to be the building block for diode-like electromagnetic metamaterials. In the talk, [Dr. Kodera] presents a circulator, an beam-steerable antenna, and a duplex antenna made using this technique. 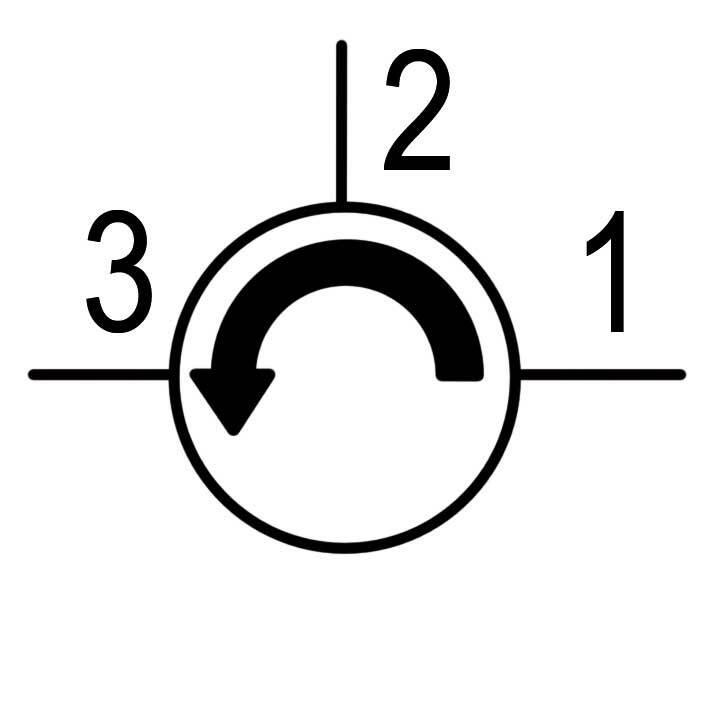 A circulator is a three-port device with the odd property that signals going in port 1 come out port 2 but not port 3, signals going into port 2 come out port 3 but not port 1, and signals going in port 3 come out port 1, but not 2. His duplex antenna is basically a radiating extension of a circulator — by using this one-way property, he is able to transmit and receive on the same antenna at the same time without getting the signals mixed up. Crazy. There’s more detail about the applications and the physics in the talk. Until this talk, we only knew [Toshiro Kodera] as [kodera2t], a prolific contributor to Hackaday.io and Tindie. We’ve covered a few of his projects before on the blog. We knew that he was interested in minimalist microcontroller projects, capable of amazing miniaturization, and a builder of quality homebrew PCBs. We were pretty certain that he wasn’t actually a guinea pig, but it’s nice to see this confirmed on stage. We’re often as impressed by what members of the Hackaday community do when they’re not hacking as when they are. It’s no surprise that some of the really brilliant hacks come from folks who are brilliant for a living as well, but it’s nonetheless inspiring to see what a pool of talent we actually have here. Thanks, [Dr. Kodera] for giving us a peek into that other side of your life. But keep up the microcontroller hacks too! ← Rust Running on the Realtek RTL8710: ESP8266 Alternative? So this molecular gyrotropy or whatever it’s called. It’s like a pitching machine that uses 2 spinning wheels to throw a ball? So a ball will be thrown if fed from behind, along with the spin but if fed from the front it will be sent back at you? Did I get that (even sort of) right? I give it a hesitant half right? Is more like a bouncer at a club that just got on duty, anyone can leave the club but only people on the list get let in. Except it’s even more than that because the path you took to get to the club also matters. I’ve only read HaDs explanation of the phenomenon. Thanks. I’m no engineer if you hadn’t guessed from previous comments. I was thinking the whole right-hand rule was making magnetic fields like the pitching machine analogy. I’ll try reading it again and watching the video when I have time and can pay attention. I wonder how refined our tools are for the creation of meta-materials? Or is that more a black magic type of thing? Most EEs are not specialized for handling such designs, as it usually requires some fairly heavy physics to accurately characterize. 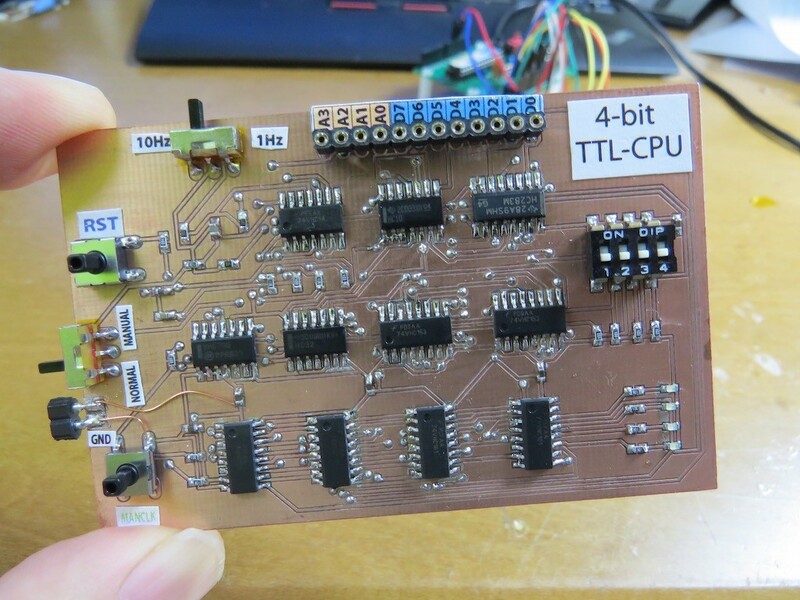 Typically, one has to look at block design as a single ecosystem-in-a-can, and abandon traditional PCB discreet component layout design concepts. Thus, it is difficult to be precise as each part can influence the behaviour of every other part on the board, and even stuff that is relatively far from the signal path can add unintended behaviours (sometimes it’s a useful property, look at 10GHz DRO sections in cheap $5 Doppler radars). Varactor diodes are common, but I am left guessing on how his team managed to get a leaded SMD to behave above UHF ranges without coupling. I’ll wager it is a bit of a stretch to claim it is a functionally equivalent option for YIG based stuff, but it is an area best suited for physics folk to pontificate over the details. I respect his philosophy of avoiding use of unobtainium, and look forward to reading the papers. Mir Williams, this is a very excellent presentation. Thank you for posting it! In any case, very exciting research! More like this! This is not new. Ferrite-based circulators and isolators have been around since the 60’s. I worked with them in radar in the 80’s. Yes, I think he mentioned ferrite circulators once or twice in the talk. Obviously they are already in wide use. Not just radar, but long-range UHF RFID in the 902-928 MHz ISM band relies on circulators for operation in order to measure the low-level back-scatter return while simultaneously transmitting 1 Watt. Full duplex transceivers could also benefit I’m sure, but I haven’t worked on that yet. The whole point of the talk, and the post, is finding a substitute for ferrite-based circulators — and maybe something that can be fabbed into an IC. If the overly dynamic sound bothers you, windows 7 and later have a “loudness equalization” checkbox in speaker settings. Various media players have additional settings for AGC or DRC. And many smartphones or tablets have built in loudness normalization for their tiny speakers. In my case, I listen with headphones for difficult audio in addition to using windows loudness normalization.